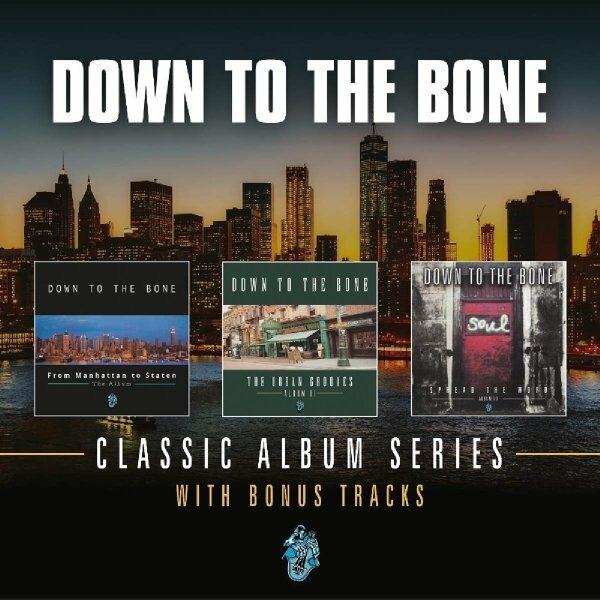 The first three albums from Down To The Bone – packaged here in a nicely-priced set, with bonus tracks too! First up is From Manhattan To Staten – a record that moves across the boroughs of New York – and which also managed to have a huge impact on the Windy City as well – given that the music of Down To The Bone was perfect for the groove of the Chicago steppers scene in the 90s! The group are a bit jazz, a bit soul, and have this chunky funky rhythm at the bottom that shows their roots in the British scene – maybe a mix of electric jazz modes with inspirations from artists like Soul II Soul or the James Taylor Quartet – taken to a style that's slightly tighter overall. There's a fair bit of programming in the rhythms, mixed with live instrumentation from group members – and titles include the classic "Staten Island Groove", plus "Muesli Brown", "Savour The Flavour", "Brooklyn Heights", "3 Days In Manhattan", "Carlito's Way", "On The Corner Of Darcy Street", and "17 Mile Drive". Urban Grooves is the second album from Down To The Bone – and a set that really continues the vibe of their debut – a mix of programmed funky rhythms and liver jazz instrumentation – all awash in a groove that really helped them cross over big on both sides of the Atlantic! The production is tight, but looser than smooth jazz of the time – and the record's got more than a few strong keyboard and saxophone solos to offset its rhythmic patterns, which often draw heavily from the best styles of the British soul scene in the late 80s and early 90s. Titles include "A Little Touch Of Soul", "Phat City Hustler", "Joy Is A Good Groove", "Bump N Hustle", "To The Bone", "The Zodiac", and "Urban Jazz". Spread The Word is the overlooked third album from Down To The Bone – a set that maybe didn't take the world by storm as much as their first two, but which still has the group very much in fine formation! All the best previous elements are in place here – that strong mix of funky jazz instrumentation with contemporary rhythmic production – almost a blend of some of the funkier club styles of the time with more mainstream fusion, at a level that made these guys both a hit on the dancefloors and for kicking back at the crib! Titles include "The Backburner", "Righteous Reeds", "Sound As A Pound", "Bridgeport Boogie", "The Lowdown", and "Black Choice". 3CD set features all albums in small LP-style jackets – and bonus tracks include "Deja Vu", "Concrete Jungle", "Staten Island Groove (live studio version)", and "Brooklyn Heights (live studio version)". © 1996-2019, Dusty Groove, Inc.